Yes, Lord Avebury, there is indeed a worldwide consensus that the way to prevent it is to make it a crime. Except in Britain where the official position is that most detecting is “responsible” so most detecting should be applauded. We believe it is high time parliamentarians took a close look at both parts of that claim as it seems very clear to us that the official statistics indicate most finds go unreported and are lost to science. (See our Erosion Counter). On the other hand, whatever does or doesn’t get reported it is entirely unclear to us how the progressive removal of a fragile and finite resource for personal recreation or profit is ethical or in the national interest and how such a policy, so at odds with policy elsewhere, can be defended. In the meantime it’s a visible secret that some professionals are increasingly unhappy with the policy. The most recent instance is Mike Heyworth of the CBA writing in the latest British Archaeology. He is to press the government to take a stricter line with detecting rallies held on DEFRA scheme land. Fine, no-one can seriously deny rallies are damaging, but we strongly doubt whether focusing on them in particular is wise. After all, focusing on nighthawking was a real gift to irresponsible detectorists as it completely deflected attention from the fact that the overwhelming proportion of damage is caused by them, perfectly legally. So wouldn’t focusing on rallies do the same thing? It’s all to do with the numbers involved. 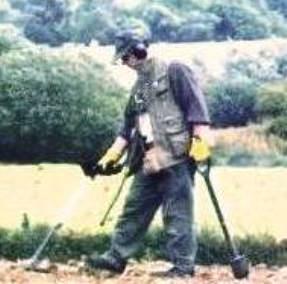 In the case of rallies, in a week when a 200 person rally takes place there could be up to 10,000 regular detectorists out in the fields and there is simply no evidence that either their behaviour or their propensity to report finds or their choice of venue is on average any different from those of rally attendees. Detecting is all about maximising the chances of finds so there can be hardly a detectorist that doesn’t deliberately target areas of archaeological potential (of which there are about a million legally available to them). Does anyone have evidence therefore to reject what seems a logical conclusion, that if Dr Heyworth persuades the government to reduce the damage caused by rallies he is asking them to address perhaps only a fiftieth of the damage that is caused by detecting? It wouldn’t be the first time professionals have missed the target in such a way – the highlighting of nighthawking had exactly the same effect, giving the opportunity for people to outrageously claim that the non-nighthawking majority must all be responsible by default. Are the public to be given the impression that doing away with rallies would do away with the damage caused by detecting? It is to be hoped not for in the absence of evidence we have to be guided by logic and on that basis it would leave 98% of the damage ongoing. Dr Heyworth will be asking “for more research to be carried out on the damage to archaeological sites and lost knowledge due to rallies”. Fine. But please, please, don’t tell people that’s other than a very minor part of the problem. He is also calling for people to send him “examples of “treasure hunting” causing damage to archaeological sites” so he can build up a portfolio of examples to present to the government. That’s problematical too, for physical evidence is likely to be hard to come by. If someone mines a non-scheduled Roman “hotspot” weekly for two years and tells no-one a lot of damage will be done yet where is the evidence of damage to present to the government? Perhaps only the culprit will know it’s a hotspot, and once it is gone it won’t be. No, portfolios tell a tiny tale, far better to present to the government the massive statistical evidence held by PAS that such things MUST be happening: millions of artefacts removed and most of them not reported. That’s what they really need to be told. Why worry about the first two when the last causes fifty times more damage? What the Hell are you up to Your Holiness, flogging off licenses to metal detect on your beaches with the caveat “Applicants should be members of an organisation which endorses the Code of Practice for Metal Detecting in England and Wales such as the Federation of Independent Detectorists or the National Council for Metal Detecting”? Don’t you understand that both the NCMD and FID codes studiously avoid asking adherents to report what they find to PAS and are just a vehicle designed to allow the non-recording yobs amongst them to bamboozle farmers into thinking they will? And Princes, evidently. If you have been told those two organisations seriously support the official Code of Practice for Metal Detecting in England and Wales why don’t you ask them why they don’t insert THAT Code on their front pages and into their Constitutions and delete their own! Sort it out please. We wouldn’t want to report you to Mike Heyworth or Lord Avebury as an egregious example of how destruction is being unwittingly facilitated up and down the country because landowners are being misinformed and misled. I’m going to avoid the obvious argument of whether or not detecting causes damage, as I do not believe it does as much as you would like Joe Public to believe……….but what about Bonafide Archaeologist’s, and the damage they cause ?, I was speaking to a lady the other week who keeps horses in a field locally to where I live, ( And Detect ! ), who after a visit by the local Archaeological Society, can now no longer use one of the fields that she used to rent, the field can no longer be cultivated either, WHY ?, because these upstanding pillars of the Archeological community dug 25 ditches in search of Dene Holes, and never bothered to come back and fill them in, thus leaving 4-5 Acres of Surrey farmland completely unusable. And you people blather on about the damage we detectorist’s do, half the major finds of recent years wouldn’t have been found if not for detectorist’s, but that’s alright, you get rallies banned, then see how much Nighthawking happens, because you’ll just drive formerly law abiding people underground. Heritage protection is not to do with tribalism and we no more approve of a local archaeology society failing to reinstate excavations than you do. The fact that you “don’t believe” detecting causes any particular level of damage is of little importance. All we or anyone else can do is be guided by the available evidence – which suggests the damage is vast. Yes, that’s what the yob end of the activity says, ad nauseam. It’s called blackmailing Society. I doubt many would do it for long though if the sanctions are strong enough.